Maximizing relief while minimizing side effects is the delicate balance that Hartmut Derendorf searches for as he investigates the processes by which drugs move throughout the body. An international expert in pharmacokinetics/pharmacodynamics, Derendorf has focused his recent research on antibiotics and inhaled corticosteroids, which are used to treat patients with chronic asthma. “In both cases the ultimate question to be answered is to find ways to optimize the individual dose to be used in a patient,” Derendorf says. In examining antibiotics, Derendorf and his team discovered new ways to measure drug concentrations at the site of infection rather than simply looking at the drug concentrations in a subject’s blood. 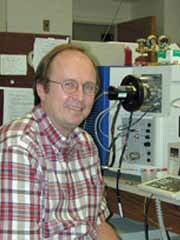 Derendorf has examined almost all inhaled steroids as part of his research in corticosteriods. Corticosteroids help control the lung inflammation of chronic asthma patients, and Derendorf’s team was able to discover a mathematical relationship that is able to predict the level of side effects with good accuracy. As a result of his work in corticosteroids and his ever-growing reputation, the U.S. Food and Drug Administration turned to Derendorf for help in developing federal guidelines for the evaluation of inhaled steroid products. His work has been supported through the years by grants from pharmaceutical companies and the National Institutes of Health. Derendorf is a fellow of the American Association of American Scientists and a fellow, honorary regent and a former secretary of the American College of Clinical Pharmacology. Recently, he was chosen president-elect of the International Society of Antiinfective Pharmacology.